Remember how Million Dollar Baby was basically two halves of different movies but somehow people loved it and it won an Oscar? This movie is kinda like that. The first half is riveting. A spy thriller with suspense, intrigue, and my favorite, constitutional law. 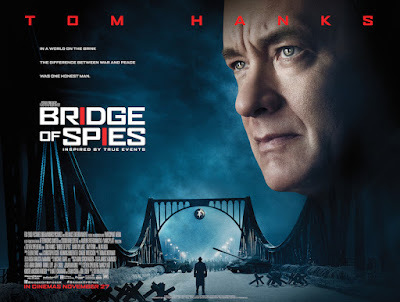 It's quiet, but brimming with possibilities and the acting by Mark Rylance as an accused Russian spy. Then...the second half of the movie happens. It's as if it forgot it was supposed to be a thriller and instead transformed into a series of political meetings where you spend all your brain power remembering who is on what side and what their demands are. It's incredibly boring. In fact, it's almost exactly why people start falling asleep the minute you try to recommend a political thriller to them. The only thing that kept me interested was knowing Tom Hanks was portraying an actual person. It is a remarkable story--just buried in an unremarkable movie. It's like Captain Phillips all over again. Except not as bad.